This ongoing international exchange of bowmakers helped the Brazilians master specific skills such as cutting and carving the stick correctly, gluing and setting the tip, working the frog, wrapping the bows grip and combing and stretching the hair. Horst John is known for the skill and care of its staff of bowmakers from a line of Brazilians who have been trained by master European craftsmen. 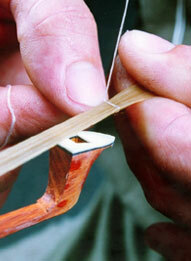 All Brazilian bowmakers got their start at Horst John.